Losing its leaves in winter, the confederate rose is no rose but instead a member of the hibiscus family. Hibiscus mutabilis matures at up to 15 feet tall and 10 feet wide if never pruned or killed back by hard winter freezes. Appropriate to grow in U.S. Department of Agriculture Hardiness Zones 7 through 10, the winter cold in zones 7 and 8 often causes this tree to become a much smaller multi-stemmed shrub. The large green, maple-like leaves make an attractive foil to the white-to-pink to deep-lavender changing flowers that don the branch tips in late summer through autumn. 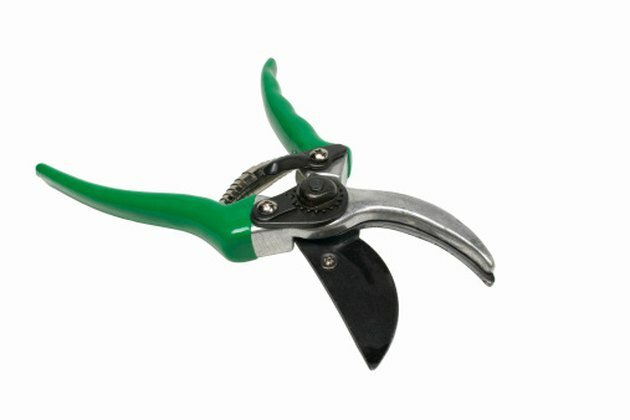 Hand pruners readily cut branches less than 1/2 inch in diameter. Prune off any broken or dead branches on the confederate rose bush any time you encounter them. Make the pruning cut 1/4 to 1/2 inch above a lower branch junction, leaf or dormant bud if no leaves are present. Reduce the length of any branch or trunk in early spring to a height of 12 to 36 inches. Since larger diameter branches occur lower in the confederate rose, use loppers if they're wider than 3/4 inch in diameter. Time this reduction or rejuvenation pruning for just before the buds begin to swell and the leaves unfurl. In subtropical areas, this may mean pruning in late winter. Clip off any suckering, thin shoots from the main trunk or larger, healthy stems on the confederate rose any time of year, too. Make the cuts flush with their attachment to the main trunk or even with the soil line. Trim off old flowers once they fade if you do not want the seed capsules to form on the branches. Some find them attractively curious, as the seed capsules are fuzzy and split open to reveal a cottony core with seeds.